Description: SMARTair is a powerful access control system that offers an intelligent, simple step up from keys. It is easy to install and access rights are stored in the door device - independent, robust, minimising communication problems. It’s easy to add and update user rights, and simple to update locks. The locks are battery powered for easy installation. Description: The Genius Rapid BGST–D107 barrier is designed to handle a high volume of traffic and has a 100% duty cycle, opening speed of 1,5 seconds, and life expectancy of 3 million operations. Left and right-hand barriers are available requiring minimum maintenance. A battery backup option is available and comes standard with an LED robot on the cabinet. Description: emerald is an advanced, intelligent IP access terminal revolutionising the security industry. A powerful reader and controller in one terminal, emerald features an LCD touchscreen, fully integrated VoIP intercom, fingerprint reader (biometric variant) and a range of remote apps and door modes that provide operational benefits beyond access control. Description: AC2000 is an enterprise access control and integrated security management system that is highly flexible to meet unique project needs. Acting as the security management system, AC2000 provides a powerful command and control front-end for alarm management of multiple systems including access control, video, intrusion, fire and perimeter detection. Description: The S700 is a next generation, fully integrated card reader and combined controller. It is IP65 rated with a capacitive light-touch keypad, graphical display and multi-colour LED light bar. The S700 is a versatile device with a range of door modes for controlling access to restricted areas, and offers operational benefits that go beyond security. Description: WIDE manual and automated boom pole systems for vehicle traffic access control, including optional extras, accessories and spares. Proudly designed, manufactured and supported in South Africa. Description: A world without barriers. Automated gates and garage doors created for residential and high-traffic areas. Available with a full range of accessories proudly designed, manufactured and supported in South Africa. Description: The most cost-effective, simple solution to take control of your world. Transmission range of up to 750 m. South Africa’s favourite and safest solution with its unhackable code and longest range. Lifetime warranty on all transmitters. Description: One of the most cost effective solutions available, Access in a Box comprises everything needed to manage up to eight doors, securely housed in a metal enclosure. Installation time and cost is reduced through the use of three-core cable and users can access their system 24/7 with their smartphone, tablet or PC, around the world. Description: The iPB4 is a competitively priced indoor fingerprint-based biometric access control unit with optional smartcard support and a small footprint, ideally suited to corporate environments. A fully programmable Wiegand interface makes the iPB4 a flexible, cost-effective solution for new and existing security systems. Description: Simple, secure and powerful: IQSuite.cloud brings the as-a-service model to the access control and workforce management space. Control and manage access to all your secure areas, and track when and where team members use the system from anywhere. Live clock events ensure that you know instantly who is using what door, and what time they were there. 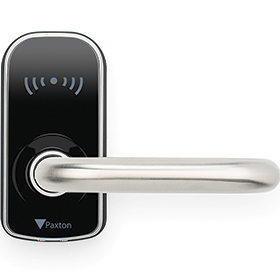 Description: PaxLock Pro is Paxton’s wireless networked access control solution in a door handle. It communicates wirelessly to the server PC via a Net2Air Bridge, reducing cabling and installation time. Description: Our networked access control system, Net2, is administered using one or more PCs and can be monitored and managed from a central location. Up to 1000 doors and 50 000 users. Licence free software for life. 5 year swap-out warranty. Simple to install, easy to use. Description: Net2 Entry is a video door entry system that works standalone or alongside Paxton’s Net2 access control. Consisting of three components that auto-detect on setup - external panel, interior monitor and door control unit - it is a plug-and-play solution that comes with a range of panel options and is suitable for a wide variety of sites. Description: PT-Guest is a fully integrated visitor management solution for access control, locally developed and supported. It captures visitor info using portable handheld wireless enabled devices, catering for pre-authorised visitors via a web, SMS or app interface. Detailed management reporting gives both security and management control of visitors. Description: PaxLock Pro is a wireless access control solution that can be installed in standalone mode or as part of a Net2 networked system, offering sites the flexibility to upgrade to a networked solution as and when required. Two designs are available for internal and external facing doors, offering more versatility for your customers than ever before. Description: MorphoWave Compact by IDEMIA allows for ease of access and quick throughput, making it perfect for high-trafficked areas like busy offices or industrial sites. Due to its cased, enclosed nature, the scanner also neutralises any external environmental factors. Able to scan QR codes, it is perfect for temporal access and visitor management. Description: PaxLock Pro is the latest addition to Paxton’s range of wireless access control solutions. The design is compatible with any DIN standard locks for a quick and simple installation. Its smart, compact appearance and standalone or networked operation means it can be used in more applications than ever before. Description: SACO delivers products designed to optimise access control and workforce efficiencies and processes through a variety of unified solutions from the SACO stable. Our products provide progressive business intelligence that simplifies decision-making, reduces turnaround times on operational activities and improves profitability. Description: SACS is a user-friendly program designed for the initial configuration and day-to-day maintenance of a site. It has been designed with simplicity in mind, however it offers an abundance of features usually only associated with complex BMS solutions at a fraction of the cost. Deep integration is available with various biometric systems, including the latest fingerprint and facial recognition devices from IDEMIA, ViRDI and Suprema. Description: This all-weather electronic cylinder is fully mobile capable, featuring Bluetooth Smart and NFC compatibility and permitting operation through Android and Apple devices. The cylinder can be enabled as an SVN-Flex card updater, allowing any door it is fitted on to act as a card updater so credentials can be updated all the time and anywhere. Description: Danalock V3 fits virtually all existing doors. Installation is done in a few simple steps, without drilling or working on the door. The system is set up and managed via an app. Users can thus use a smartphone to control the door, residents and guests as well as the house. Communication is wireless and AES 256-bit encrypted. Description: The Keys as a Service (KS) cloud-based solution allows real-time access management on the go. Users do not have to install any software, their system is always up to date and they can easily integrate with third-party systems via API. Mobile Key technology gives the ability to open doors through Mobile Key in SALTO KS customers’ mobile app. Description: SALTO’s SVN-Flex technology offers access management with increased security and more convenience. As end users do not need extra components like wall readers or door controllers, spending on hardware is lower. Users do not have to go to specific doors or locations to update their cards, as any wireless door can be activated as an SVN-Flex updater. Description: Secutel’s access control solution makes use of Matrix COMSEC products to harness the latest technology to provide powerful, easy to install and use solutions. This empowers Secutel to develop systems for the mid-market (education, healthcare, retail and public sector) and provide solutions for a wide range of sites and requirements. Description: Cloud and web-based open security platform. Integrate with third- party systems, build new applications and functions into BioStar 2 with web API, device SDK and web inlays. Features cloud implementation and updates, auto user synchronisation, auto device discovery, anti-passback, fire alarm and BioStar Mobile for Android and iOS. Description: The Velocity Traffic Barrier is an automatic high-speed vehicle barrier fitted with the latest motor drive and control technology. The BLDC motor and planetary gearbox offer excellent torque and speed curve characteristics, and a battery backup system ensures uninterrupted operation in the event of a power failure. Description: The Citadel booth offers a high-security solution for any entrance. Fitted with 26 mm bullet resistant curved and flat glass, it offers resistance to any attempted armed entry. Each curved door is fitted with a geared motor which allows for access controlled entry and a metal detector with various sensitivity settings is embedded in the frame. Description: The Pulse Automatic Special Needs gate is ideal for unassisted special needs and wheelchair access into a building. The gate is fitted with a heavy duty BLDC motor and planetary gearbox and is manufactured from 304 grade brushed stainless steel. 10 mm toughened glass is used for the glass wing. In the event of a collision, the gate auto reverses. Description: Powerful, secure, flexible, enterprise level, multi-site access and automation control system. Stable, industrial, intelligent and programmable hardware and software for card readers, door control units and hardware modules used in various applications, such as access automation, time recording, people management, biometrics and camera control. Description: Veracitech is an integration partner and value-added reseller for Traka intelligent key cabinets and locker systems. Veracitech has a fully integrated solution for managing Traka systems in the XMP-Bablyon platform, allowing full integration and control of keys and lockers together with access control and automation. * Key management, lockers, key cabinets, asset lockers, access control, people management, biometrics. * Integration partner for Traka key cabinets and locker systems on the XMP-Babylon platform. Description: UHF 6Pro is a high-performance, long-distance RFID reader. It is configured with an Impinj R2000 chip and waterproof casing. It has stable performance, long service life, minimised external interference and upgraded long reading distance. Therefore, it can be applied in many remote identification fields. Description: ZK-VSCN100 is a portable under-vehicle inspection system, used to inspect a vehicle’s undercarriage. When a vehicle passes, the system can quickly recognise the licence plate and generate a high definition image of its undercarriage, which will be recorded in the computer. The system can quickly and accurately identify suspicious objects. Description: The C5S supports all card readers, such as the ZK KR-series; Wiegand readers and RS-485 card readers; HID Prox, iClass and XceedID multi-card technology. It offers users more than access control: After programming, auxiliary relays can interface with lights, alarms and intrusion detection panels. There is a case protecting the C5S controller. Description: The LPRS2000 is a hybrid identification vehicle management terminal that adopts multiple recognition modes for long-range RFID and licence plate recognition. It combines the latest developed high-performance UHF reader to ensure that the capture rate and recognition accuracy of fixed vehicles are up to 100%.